If the shower enclosure in your bathroom is cracked, leaking, or otherwise unsightly, it’s time to contact the home improvement pros at 31-W Insulation. Not only can a faulty enclosure put a damper on the way your bathroom looks, but it can also pose a safety risk as water can leak out and onto the floor. For the past 40 years, 31-W has provided homeowners in Orlando, Florida, and surrounding areas with top-of-the-line shower enclosures that have made their bathrooms safer and more attractive. You can choose from the above styles the enclosure that works best for your space and customize it with optional features such as frosted glass, hardware, and more. What’s more, when you partner with 31-W, you can be confident that your new shower enclosure will be installed flawlessly by our highly trained technicians, all of whom are company employees. 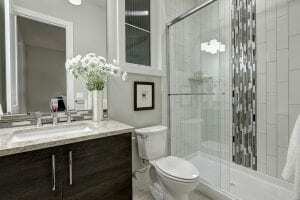 To learn more about the glass shower enclosures we install throughout the Orlando area, contact 31-W Insulation today. We would be happy to answer any questions you may have.